Karymsky (Kamchatka): Activity at the volcano, in continuous intermittent explosive activity for many years, seems to be elevated at the moment. Several explosions have been reported during the past days through observations of ash plumes reported reaching up to 18,000 ft (5.5 km) altitude (Tokyo VAAC). Nishino-shima (Volcano Islands, Japan): The eruption seems to have ended in mid December. 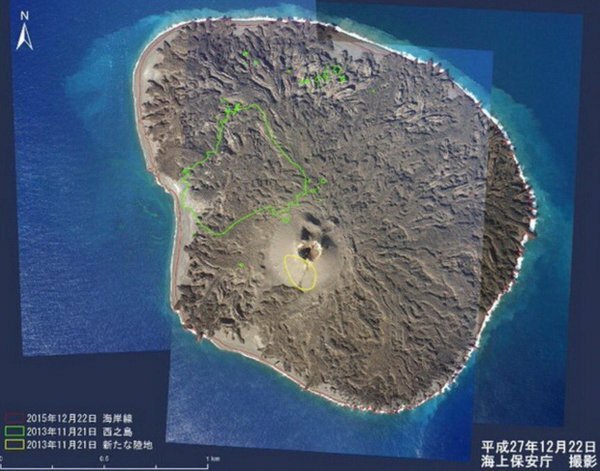 During the past two visits of the Japanese Coast Guard on 27 Dec and 3 Jan 2016, no more eruptive activity has been noted. Karangetang (Siau Island, Sangihe Islands, Indonesia): Ash from the volcano has been observed on satellite imagery during 11-12 Jan, Darwin VAAC reported. Likely, this came from a larger rockfall triggering a small pyroclastic flow, but this needs to be confirmed. The latest VSI report from this morning only mentions continuing glow from the active summit lava dome and small to moderate rockfalls. Sinabung (Sumatra, Indonesia): The volcano's eruption continues with little changes into its third year. Slow lava extrusion at the summit results in occasional small to moderate pyroclastic flows as well as sporadic explosions. This activity occurs in weeks-to-month long alternating phases of more and less intense frequency, as lobes of the overspilling dome grow too large and then break off to generate a series of collapses within a shorter time. Both the pyroclastic flows and explosions produce ash plumes that regularly rise a few km above the volcano and are often reported by Darwin VAAC. Bromo (East Java, Indonesia): Ash emissions of varying intensity have been near continuous during the past weeks. Dukono (Halmahera): The volcano continues to be very active with near-continuous ash emissions from the crater. Darwin VAAC reported an ash plume extending 70 km to the south of the volcano this morning. Lokon-Empung (North Sulawesi, Indonesia): The volcano remains at significant unrest and moderate to large explosions could occur any time, the latest evaluation report of the volcano observatory states and alert level is being maintained at 3 ("siaga") on a scale of 1-4. Santiaguito (Guatemala): INSIVUMEH reports strong degassing, a few weaker explosions and small to moderate rockfalls on the eastern side of the active Caliente lava dome. Pacaya (Guatemala): The active intra-crater cone continues to grow (and slowly fill the crater). During clear nights, incandescence can be seen from the Mackenney crater. Momotombo (Nicaragua): A strong vulcanian explosion occurred yesterday at 12:10 local time at the volcano. An ash plume rose approx 3 km from the summit and generated a small pyroclastic flow. San Miguel (El Salvador): A new phase of eruptive activity began at the volcano on Monday. Accompanied by a spike in volcanic tremor, weak to moderate ash emissions have been occurring from the main crater. This activity, the 22nd eruptive phase since Dec 2013 according to MARN, has been decreasing since yesterday. Copahue (Chile/Argentina): Near-continuous, but generally weak ash emissions and intense degassing continue at the volcano. Sernageomin maintains alert level yellow. Nevados de Chillán (Central Chile): A short pulse of ash emissions occurred in the evening of 8 Jan 2016 around 18:49 local time. No further emissions have occurred since and it is believed that the event was caused by phreatic activity of the shallow hydrothermal system of the volcano (not by fresh magma). Sernageomin raised the alert status of the volcano to yellow.